Kyrgyzstan ( Kyrgyz and Russian: Кыргызстан, variously transliterated, also Kirgizia or Kirghizia), officially the Kyrgyz Republic, is a country in Central Asia. Landlocked and mountainous, it borders Kazakhstan to the north, Uzbekistan to the west, Tajikistan to the southwest and the People's Republic of China to the southeast. Kyrgyzstan means the "Land of the Kyrgyz". The country is also occasionally called "the Switzerland of Central Asia". The earliest ancestors of the Kyrgyz people, who are believed to be of mixed Mongol and Kipchak descent, probably settled until the 10th century around what is now the Tuva region of Russia. With the rise of the Mongol Empire in the 13th century, the Kyrgyz migrated south. They did not emerge as a distinct ethnic group until the 15th century. Various Turkic peoples ruled them until 1685, when they came under the control of the Kalmyks ( Oirats, Dzungars). Islam is the predominant religion in the region, and most of the Kyrgyz are Sunni Muslims of the Hanafi school. In the early 19th century, the southern part of what is today Kyrgyzstan came under the control of the Khanate of Kokand. The territory, then known in Russian as "Kirgizia", was formally incorporated into the Russian Empire in 1876. The Russian takeover instigated numerous revolts against tsarist authority, and many of the Kyrgyz opted to move to the Pamirs and Afghanistan. In addition, the suppression of the 1916 rebellion in Central Asia caused many Kyrgyz to migrate to China. Since many ethnic groups in the region were (and still are) split between neighbouring states, at a time when borders were more porous and less regulated, it was common to move back and forth over the mountains, depending on where life was perceived as better; this might mean better rains for pasture or better government after oppression. In June 1990, ethnic tensions between Uzbeks and Kyrgyz surfaced in the Osh Oblast, where Uzbeks form a majority of the population. Violent confrontations ensued, and a state of emergency and curfew were introduced. Order was not restored until August. In December 1990 the Supreme Soviet voted to change the republic's name to the Republic of Kyrgyzstan. (In 1993, it became the Kyrgyz Republic.) In February 1991, the name of the capital, Frunze, was changed back to its prerevolutionary name of Bishkek. The Kyrgyz language replaced Russian as the official language in September 1991. (Kyrgyz is a member of the Southern Turkic group of languages and was written in the Arabic alphabet until the 20th century. Latin script was introduced and adopted in 1928, and was subsequently replaced by Cyrillic in 1941.) Despite these aesthetic moves toward independence, economic realities seemed to work against secession from the Soviet Union. In a referendum on the preservation of the Soviet Union in March 1991, 88.7% of the voters approved the proposal to retain the Soviet Union as a "renewed federation." On August 19, 1991, when the State Emergency Committee assumed power in Moscow, there was an attempt to depose Akayev in Kyrgyzstan. After the coup had collapsed the following week, Akayev and Vice President German Kuznetsov announced their resignations from the Communist Party of the Soviet Union (CPSU), and the entire bureau and secretariat resigned. This was followed by the Supreme Soviet vote declaring independence from the Soviet Union on August 31, 1991. The Tulip Revolution after the parliamentary elections in March 2005 forced President Akayev's resignation on April 4, 2005. Opposition leaders formed a coalition and a new government was formed under President Kurmanbek Bakiyev and Prime Minister Feliks Kulov. Political stability appears to be elusive, however, as various groups and factions allegedly linked to organized crime are jockeying for power. Three of the 75 members of Parliament elected in March 2005 have been assassinated since then, and another member was assassinated on 10 May 2006 shortly after winning his murdered brother's seat in a by-election. All four are reputed to have been directly involved in major illegal business ventures. The 1993 constitution defines the form of government as a democratic republic. The executive branch includes a president and prime minister. The parliament currently is bicameral. The judicial branch comprises a Supreme Court, a Constitutional Court, local courts, and a Chief Prosecutor. In March 2002, in the southern district of Aksy, five people protesting the arbitrary arrest of an opposition politician were shot dead by police, sparking nationwide protests. President Akayev initiated a constitutional reform process which initially included the participation of a broad range of government, civil, and social representatives in an open dialogue, leading to a February 2003 referendum marred by voting irregularities. The amendments to the constitution approved by the referendum resulted in stronger control by the president and weakened the parliament and the Constitutional Court. Parliamentary elections for a new, 75-seat unicameral legislature were held on February 27 and March 13, 2005, but were widely viewed as corrupt. The subsequent protests led to a bloodless coup on March 24, after which Akayev fled the country and was replaced by acting president Kurmanbek Bakiyev. (see: Tulip Revolution). Interim government leaders are developing a new governing structure for the country and working to resolve outstanding constitutional issues. On July 10, 2005, acting president Bakiyev won a presidential election in a landslide, with 88.9% of the vote and was inaugurated on 14 August. However, initial public support for the new administration substantially declined in subsequent months as a result of its apparent inability to solve the corruption problems that have plagued the country since its independence from the Soviet Union, along with the murders of three members of parliament. Largescale protests against president Bakyiev took place in Bishkek in April and November of 2006, with opposition leaders accusing the president of failing to live up to his election promises to reform the country's constitution and transfer many of his presidential powers to parliament. Kyrgyzstan is divided into seven provinces (sing. oblast (область), pl. oblasttar (областтар)) administered by appointed governors. The capital, Bishkek, is administratively an independent city (shaar). Map of the administrative divisions of Kyrgyzstan. Each province comprises a number of districts ( rayon), administered by government-appointed officials (akim). 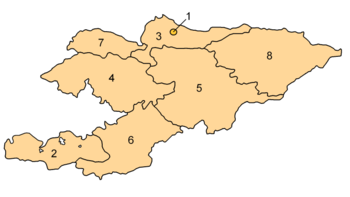 Rural communities (ayıl ökmötü) consisting of up to twenty small settlements, have their own elected mayors and councils. Kyrgyzstan is a landlocked country in Central Asia, bordering Kazakhstan, People's Republic of China, Tajikistan and Uzbekistan. The mountainous region of the Tian Shan covers the majority of the nation, with the remainder made up of its valleys and basins. Issyk-Kul in the north-western Tian Shan is the largest lake in Kyrgyzstan and the second largest mountain lake in the world after Titicaca. The highest peaks are in the Kakshaal-Too range, forming the Chinese border. Peak Jengish Chokusu, at 24,400 feet (7,439 m), is the highest point and is considered by geologists (though not mountaineers) to be the northernmost 23,000 foot (7,000 m) peak in the world. Heavy snowfall in winter leads to heavy spring floods which often cause serious damage downstream. The runoff from the mountains is also used for hydro-electricity. Kyrgyzstan has significant deposits of rare metals including gold and also some coal, petroleum and natural gas. Less than 8% of the land is cultivated, and this is concentrated in the northern lowlands and the fringes of the Fergana Valley. Bishkek in the north is the capital and largest city, with approximately 900,000 inhabitants in 2005. The second city is the ancient town of Osh, located in the Fergana Valley near the border with Uzbekistan. The principal river is the Naryn, flowing west through the Fergana Valley into Uzbekistan, where it meets another of Kyrgyzstan's major rivers, the Kara Darya and forms the Syr Darya which eventually flows into the Aral Sea — although the massive extraction of water for irrigating Uzbekistan's cotton fields now causes the river to dry up long before reaching the Aral Sea. The Chui river also briefly flows through Kyrgyzstan before entering Kazakhstan. There is one exclave, the tiny village of Barak, Kyrgyzstan , (population 627) in the Fergana valley. The village is surrounded by Uzbek territory and located between the towns of Margilan and Fergana. There also are two enclaves belonging to Tajikistan: Vorukh (exclave area between 95 and 130 km² [37–50 sq. mi], population estimated between 23,000 and 29,000, 95% Tajiks and 5% Kyrgyz, distributed among 17 villages), located 45 kilometres (28 mi) south of Isfara on the right bank of the Karafshin river, and a small settlement near the Kyrgyz railway station of Kairagach. Despite the backing of major Western donors, including the International Monetary Fund (IMF), the World Bank and the Asian Development Bank, the Kyrgyz Republic has had economic difficulties following independence. Initially, these were a result of the breakup of the Soviet trading bloc and resulting loss of markets, which impeded the republic's transition to a free market economy. The government has reduced expenditures, ended most price subsidies, and introduced a value-added tax. Overall, the government appears committed to the transition to a market economy. Through economic stabilization and reform, the government seeks to establish a pattern of long-term consistent growth. Reforms led to the Kyrgyz Republic's accession to the World Trade Organization (WTO) on December 20, 1998. The Kyrgyz Republic's economy was severely affected by the collapse of the Soviet Union and the resulting loss of its vast market. In 1990, some 98% of Kyrgyz exports went to other parts of the Soviet Union. Thus, the nation's economic performance in the early 1990s was worse than any other former Soviet republic except war-torn Armenia, Azerbaijan, and Tajikistan, as factories and state farms collapsed with the disappearance of their traditional markets in the former Soviet Union. While economic performance has improved considerably in the last few years, and particularly since 1998, difficulties remain in securing adequate fiscal revenues and providing an adequate social safety net. Agriculture is an important sector of the economy in the Kyrgyz Republic. By the early 1990s, the private agricultural sector provided between one-third and one-half of some harvests. In 2002 agriculture accounted for 35.6% of GDP and about half of employment. 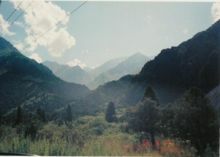 The Kyrgyz Republic's terrain is mountainous, which accommodates livestock raising, the largest agricultural activity. Main crops include wheat, sugar beets, potatoes, cotton, tobacco, vegetables, and fruit. Wool, meat, and dairy products also are major commodities. Agricultural processing is a key component of the industrial economy, as well as one of the most attractive sectors for foreign investment. The Kyrgyz Republic is rich in mineral resources but has negligible petroleum and natural gas reserves; it imports petroleum and gas. Among its mineral reserves are substantial deposits of coal, gold, uranium, antimony, and other rare-earth metals. Metallurgy is an important industry, and the government hopes to attract foreign investment in this field. The government has actively encouraged foreign involvement in extracting and processing gold. The Kyrgyz Republic's plentiful water resources and mountainous terrain enable it to produce and export large quantities of hydroelectric energy. On a local level, the economy is primarily kiosk in nature. A large amount of local commerce occurs at bazaars and small village kiosks. Commodities such as gas are often sold road-side in gallon jugs. A significant amount of trade is unregulated. There is also a scarcity of common everyday consumer items in remote villages. Thus a large number of homes are quite self-sufficient with respect to food production. There is a distinct differentiation between urban and rural economies. The principal exports are nonferrous metals and minerals, woolen goods and other agricultural products, electric energy, and certain engineering goods. Imports include petroleum and natural gas, ferrous metals, chemicals, most machinery, wood and paper products, some foods, and some construction materials. Its leading trade partners include Germany, Russia, People's Republic of China, and neighboring Kazakhstan and Uzbekistan. The World Almanac 2005 reported that Kyrgyzstan's population is slightly more than 5 million, estimating it at 5,081,429. Of those, 34.4% are under the age of 15 and 6.2% are over the age of 65. The country is rural; only about one-third (33.9%) of Kyrgyzstan's population live in urban areas. The average population density is 69 people per square mile (29 people per km²). 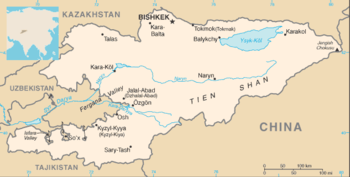 The nation's largest ethnic group is the Kyrgyz, a Turkic people. The Kyrgyz comprise 69.5% of the population and have historically been semi- nomadic herders, living in round tents called yurts and tending sheep, horses and yaks. This nomadic tradition continues to function seasonally as herding families return to the high mountain pasture (or jailoo) in the summer. The retention of this nomadic heritage and the freedoms that it assumes continue to have an impact on the political atmosphere in the country. The name Kyrgyz, both for the people and for the nation itself, is said to mean "forty girls", a reference to the Manas of folklore unifying forty tribes against the Mongols. Other ethnic groups include ethnic Russians (9.0%) concentrated in the North and Uzbeks (14.5%) living in the South. Small but noticeable minorities include Tatars (1.9), Uyghurs (1.1%), Kazakhs (0.7%) and Ukrainians (0.5%). Of the formerly sizable Volga German community, exiled here by Stalin from their earlier homes in the Volga German Republic, most have returned to Germany, and only a few small groups remain. About 75% of the population practices Islam. The main Christian churches are Russian Orthodox and Ukrainian Orthodox. A small minority of Germans are Protestant Christians, mostly Lutherans or Baptists. There are about 40 Kyrgyz tribes. This is symbolized by the 40-rayed yellow sun in the centre of the flag of Kyrgyzstan. The lines inside the sun represent the crown or tunduk (Kyrgyz түндүк) of a yurt, a symbol replicated in many facets of Kyrgyz architecture.The red portion of the flag represents the banner of the Kyrgyz hero, Manas. The American University of Central Asia. KRSU - Kyrgyz Russian Slavonic University . The national sports reflect the importance of horse riding in Kyrgyz culture. Ulak Tartysh is a team game in which the two mounted teams attempt to deliver the carcass of a goat weighing 65 to 90 pounds over the opposition's goal line. Players are allowed to wrestle the goat from an opponent.